The conversation about technology in commercial and hospitality spaces is only just getting started. Here are the key terms you need to get involved with this critical point in design history. By now, it’s impossible to ignore the all-encircling grip of technology on contemporary life. From smart watches and phones to intuitive appliances, wait staff-free restaurants, and the inescapable ubiquity of Wi-Fi, technology has well and truly embedded itself into all aspects of how we live, work, and play. Discussions about data mining, cryptocurrency, and the far-reaching repercussions of technology have become fixtures of the cultural landscape, and are the subjects of everything from journalistic think pieces to morning tea talk at the office water cooler. Everyone, it seems, is an expert in technology these days. To the uninitiated, discussions about technology can seem absolutely impenetrable, thanks to vocabulary that is almost as complex and opaque as the technology itself. To fully understand the centrality of technology to the commercial and hospitality spaces of tomorrow and harness its potential through design, it is critical that the architecture and design industry overcomes this language barrier. The backbone of the flexible contemporary workspace, the ABW model allows employees to select the best work setting for their particular workplace needs. Employees are presented with a number of different workplace settings and are given the freedom to choose whichever they feel is best suited to their needs on a particular day. Technology has irreversibly changed the ways in which we work and play. New possibilities for remote working have blurred the lines between commercial and hospitality spaces – now, cafes and restaurants are as much a viable space for working and client meetings as they are places for leisure. ‘Agility’ refers to the demand for design to adapt quickly to changing user needs and behaviours. As digitised files and workflows become the norm, more and more offices are relying on ‘The Cloud’ to manage and store their data. In short, The Cloud is a network of servers that stores data remotely, instead of relying on local computers and devices. In so doing, it enables businesses and individuals to store massive amounts of data without investing in expensive, space-consuming hardware. The Cloud can be accessed from any device with an Internet connection, and has opened up a breadth of new possibilities for remote working and flexible work hours. Concerns about digital privacy have spiked in recent years, and have reached fever pitch in the wake of the recent Cambridge Analytica - Facebook scandal. Encryption protects files from prying eyes and third parties, as it requires a password or PIN for viewing: without this, the file contents are unreadable. This is crucial for maintaining IP and security in office environments, and has obvious benefits in the hospitality space, where guest and payment information must be kept confidential. Encryption offers a major incentive for business holders and individuals to move toward digital file storage, and provides the peace of mind that paper filing systems just can’t deliver. Perhaps one of the most notoriously nebulous tech terms in recent years, ‘The Internet of Things’ describes the concept of connecting virtually any electronic device to the Internet and/or other devices. Encompassing everything from phones and laptops to coffee makers, watches, and lights, The Internet of Things facilitates the unprecedented levels of connectivity in today’s work and hospitality spaces. In the commercial space, The Internet of Things is often considered in terms of its enhancement of productivity, whereas in the hospitality space it is a valuable means of giving guests a high degree of control over their surroundings (think: hotel rooms that allow entertainment switches, lighting, and thermostats to be controlled from the guest’s own smart phone). Often styled as ‘UX’, ‘User Experience’ refers to the way that a user interacts with a technological product such as a device, application, or website. As technology becomes increasingly central to commercial and hospitality space design, it is critical that UX is optimised to deliver engaging, positive experiences and drive success within a space. 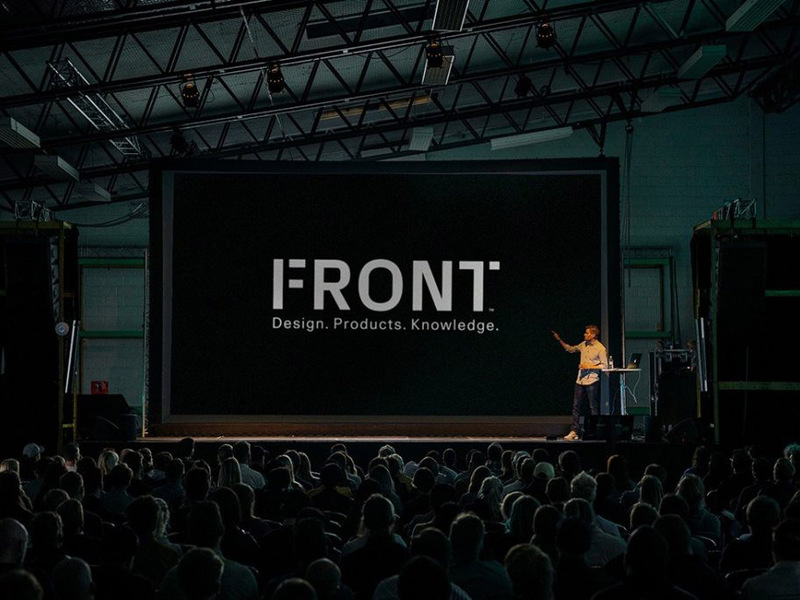 Enquire today to participate in or visit FRONT, coming 9-10 August 2018.